Daily drawings from my sketch book and thoughts scooped from the well. I did a whole series of work that I called, " The Mother's Heart Series" it was about the more difficult side of being a parent/mother. It was about the heart ache and sorrow we experience when our children experience difficulty and pain. The grief can be as agonizing as death in some cases. In the series gems, often worn on a chain as a necklace or in this case imbedded in the heart represent the mother's offspring. (Remember the old testament account of the high priest wearing an ephod on his chest? An ephod had 12 stones on it which represented the 12 tribes of Israel. The high priest wore this to bear those 12 tribes before God when he entered the Holy of Holies. In the same way, the mother bears her children before God always, in constant prayer.) The painting actually is a bit larger and the breasts are bare but in this case I felt it would be fitting to crop it. The eyes are really expressive, a beautiful piece. I took a peek at your portfolio and love your work! Your abstracts would make AMAZING quilts. I too, love the eyes and also the stars in back ground. Constantly, you inspire me. It is beautiful, you should post more of the series! Amy, thank you so much. I am always happy when someone takes the time to look at the other stuff in my portfolio, Woo hoo. I suppose the abstracts already have a "pieced" kind of look and would lend themselves to quilts. I love to quilt but don't have time anymore. 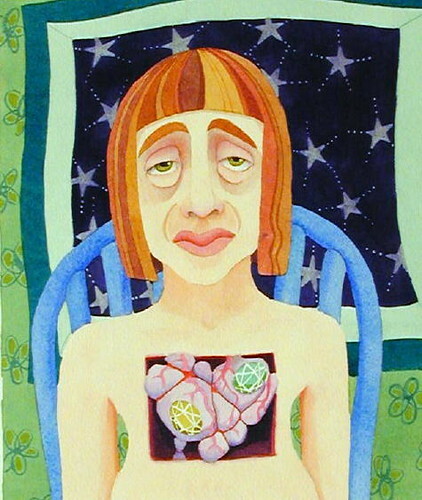 Kim, I will try to put all of the images from the Mother's Heart series in a link and share that when I can. Hi Sheila - I really love this, it has so much emotion and depth. It's fantastic, truly inspirational. Thank you very much for your comment on my entry also! a beautiful woeful illustration. wonderful work!! Those are beautiful eyes and the sorrow is vibrant. I love it! Such beautiful work! The eyes tell so much of the story. how wonderful...your work is lovely! This is a Flickr badge showing public photos from Sheila Hudson tagged with drawing. Make your own badge here. I love to draw, the more I draw the more I love it! I am an artist who works in several mediums but this year (2004) my main medium is graphite, ink and markers and it's been a blast. Update about Holly, Peace, Etc.